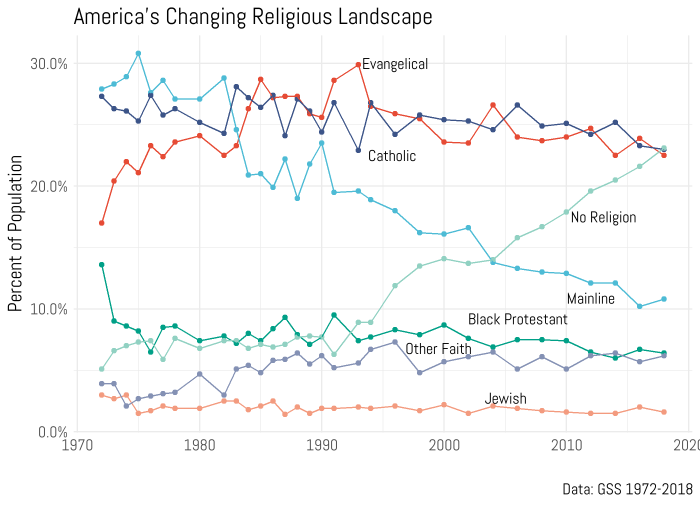 One analyst observes, “The ‘nones’ are not slowing down. Their share of the population is continuing to climb ~1 percent every two years and has done so for the past 15 years or so. If current trends keep up then they will be the largest group in the United States in the next five years, statistically.” Note the steep climb since the mid-1990s. The reasons for this sweeping change are overly determined and I don’t have the inclination here to take a deep dive on the matter. But I do want to observe that all American institutional life is currently under siege. There is a vast social upheaval underway rocking all traditional forms of social organization—religious, political, educational, & community-based. The UMC fracture is but one lone example of the tectonic shifts. I believe there will be a reclamation of well-functioning institutions since they’re an inevitable outcome of our desire to accomplish good ends over long stretches of time. i.e. We can’t cure cancer with a go-fund-me campaign. This requires enormous effort and resources over time. Think of it!—hospitals, universities, doctors, researchers, funders, politicians, coders, etc. in a collaborative dance over decades and decades, a veritable institutional cornucopia. (It occurs to me that the same is true for a life that’s well situated in healthy community for 80 or 90 years. The opioid epidemic is surely one indicator of the breakdown of healthy community.) In the meantime, we ride the menacing tremors that are reshaping our social landscape. As for the church, I’ve always been aware that the organized forms of religion were not faith itself, but a means for holding, pointing to, encouraging, even occasionally embodying, the things that matter most of all. Things like the Christ Church mission to love God and neighbor, for instance. Yes, I even believe there will one day be a resurgence of effective religious re-organizing. This will occur as a natural human response to the great mystery of our being born and having to die and the re-discovery of the actual content of the life and times of Jesus of Nazareth, something portions of the church has unfortunately and inexplicably lost track of as its principal focus. As the tremors wax and wane, I encourage you to think of Christ Church as an outpost of safety, inclusion, and community that remains committed to walking the path Jesus blazed. As I said in a recent sermon, denominations come and go but the gospel will stand for ever. The church that understands this, is the church that has the best chance for emerging on the other side of the earthquake as a beacon of hope. I invite you to help make it so.